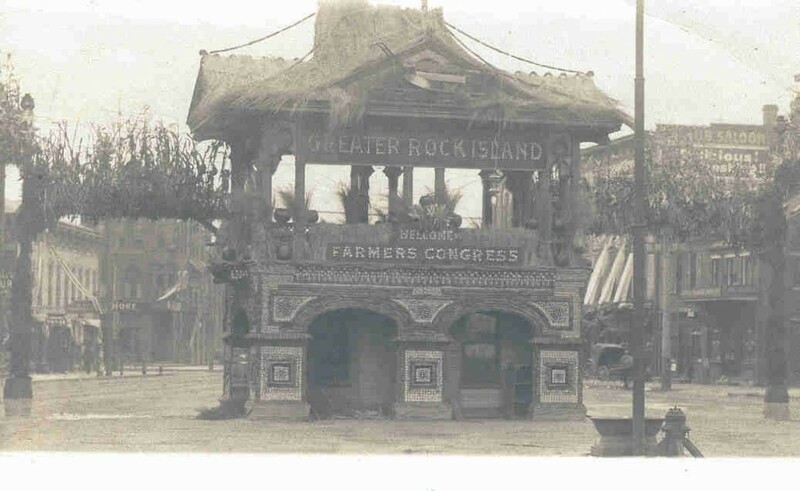 News coverage of the weeklong gathering of the 24th annual Farmers National Congress began on Saturday, October 6, 1906, when the Argus reported that downtown Rock Island was taking on a festival appearance in anticipation of thousands of visitors. The story was accompanied by a plea for citizens to make spare bedrooms available to Congress attendees, as the number expected greatly exceeded the available hotel accommodations. Mayor McKaskrin observed that it was a great honor for Rock Island to be selected as the site of the Farmers Congress. Governors of Illinois and Iowa and former governors of Minnesota and, surprisingly, even Alaska planned to attend. Details of the Congress were covered in the newspaper on a daily basis during the ensuing week. Although high winds delayed many travelers, over a thousand had arrived by Monday, when the Congress officially opened. On Monday morning, Congress attendees paraded down 2nd Avenue from the Harper House Hotel at 19th Street (now demolished), to the Illinois Theatre at 16th Street (later Hyman’s Furniture Store and now a YWCA facility) where opening ceremonies were held. The parade’s route took them through a downtown festive with harvest finery. Unfortunately, many of the decorations were bedraggled because of the high winds. It was later reported that a $5.00 prize was awarded to 1629 2nd Avenue for creating the best storefront decorations. Today’s postcard gives a hint of those downtown decorations in its depiction of Market Square during the Congress. Market Square was the triangle between 16th and 17th Streets at 2nd to 3rd Avenue. Although it was a public space, Market Square was not a park, but was a working marketplace – a real farmers’ market. As early as 1855, there was a Market Square and a building of some sort here, known at the time as Harper’s Folly. Whether that building is the same one as in this picture is not known. The view here is looking south from 2nd Avenue and shows the building in Market Square decked out in a manner reminiscent of a miniature South Dakota Corn Palace. We can see ears and shocks of corn, sheaves of wheat, and pumpkins, all artfully arranged to welcome the farmers and their wives to Rock Island and the Congress. Notice the old hand plow hung in the gable. Temporary archways extended from the structure and were crowned with what appears to be growing corn. Although the specifics of the Market Square decorations were not mentioned in the extensive Argus coverage of the Congress, this Real Photo card as well as a color lithograph version of it are the only known postcards from the Congress. When they arrived at the Illinois Theater, visitors saw the stage decorated as a barnyard, complete with real horses, chickens, and corn shocks (perhaps so the farmers wouldn’t be homesick on their visit to our big city). Illinois Governor Deneen made a welcoming address that celebrated prairie lands opened to cultivation in recent years, thanks to drainage ditches and tiling. Congress goers later adjourned to the Rock Island skating rink at 16th Street and 5th Avenue (no longer standing) which served as a convention hall for the week and featured both a “Carnival “ and Manufacturers’ Exhibits. Other activities offered to attendees included tours of local factories, boat rides on the Mississippi, and free trolley tours around Rock Island, Moline and Davenport. But it wasn’t all play time. The Farmers Congress was serious business. Farmers discussed techniques to improve production and political strategies that would help them get the best prices for their products. They also recommended that domestic science (later called home economics) should be taught at all schools. Each day, the Argus reported on the many events and presentations, and listed the attendees from throughout Illinois and elsewhere. By the time the convention closed on October 13, the wind torn decorations were ready to come down. But Rock Islanders were happy with the attention our city had received, and satisfied that we had been wonderful hosts to the nation’s farmers. Market Square continued in use until the mid 20th Century when there was no further need for a farmers’ market. The site was then used for auto parking until the open space was finally eliminated to enable the construction of the hotel building that still occupies the site. This article by Diane Oestreich is slightly modified from the original, which appeared in the Rock Island Argus and Moline Dispatch on August 19, 2001.